A lovely couple poses for their portrait at the Stuting and Sohn studio in Barmen, Germany. The man and woman are well dressed. The man is holding reading material on his lap. One of the more remarkable aspects of this image is the gentleman’s interesting mustache. The mustache is bushy and curls wonderfully at each end. The photographer, Stuting, is cited in two photographic journals published in 1890 (American Journal of Photography, The Photographic News). Stuting’s studio was located in Barmen, which merged with four other towns in 1929 to form the city of Wuppertal. Barmen is also known as the birthplace of socialist theorist Friedrich Engels. 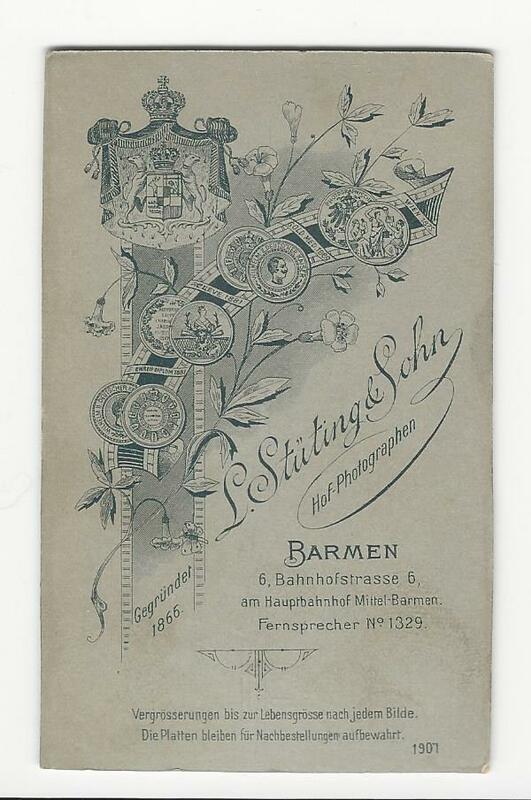 Finding a photographer in Barmen at the turn of the century must not have been much of a problem. The Cabinet Card Gallery has a number of carte de visite photographs originating from studios in Barmen. Printed on the lower right hand corner of the reverse of this cdv is the number “1907”. This likely represents the date that this photograph was taken despite the fact that most photographers stopped producing carte de visite photographs by that date.